Anger is an emotion that is a result of dissatisfaction, foolish behavior, frustration, irrelevant arguments, unfair blame or claims or an obvious mistake. Anger or losing temper is an instant emotion that can be called as one of the most dangerous components within the human body. It could be directed to anyone including the person himself. When it is directed to the person himself the reasons generally are failure, betrayal or the dissatisfaction of not completing the targeted goal. Further anger is an emotion that cannot be ignored or forgotten. People feel anger, rage, fury, wrath, and finally losing temper, etc. But, Is anger and temper one and the same thing? Apparently Not! It is a strong emotion or a feeling that is directed towards the supposed grief or injustice. It can be caused due to unfortunate situation. It is a sudden outburst of anger or a characteristic state of feeling. It is a disposition to exhibit rampant anger. The difference can be clearly stated in one sentence ‘as anger is an emotion and when that emotion leads to linked consequences, it can be called as temper‘. Anger is a natural emotion which cannot be totally eliminated from the system, whereas temper on the other hand can be controlled, restricted. It can be conquered calmly. Even though both the words are linked, their meanings are varied accordingly. Why do you get Angry? Are you Short-Tempered? They are the people who have high tolerance level towards any kind of nuisance going around. They can very efficiently let go of the offensive statements or remarks before actually reacting towards the offender. Verbal outbursts are rarely expected from the people of this nature on most of the situation. They can very effectively set aside their anger even when they are irritated to a certain extent. Their decisions are relatively more serious and permanent compared to the people who are short tempered. They are patient but when they are angry, they can be very serious about it. Apologizing plainly to them doesn’t work a bit. They need a real genuine apology to get even with the offender. These are the people who have extremely low tolerance level. They cannot handle even a least offensive bit of arguments or actions. They might instantaneously initiate or reply back in a verbal outbreak. Their irritation can quickly lead to another set of anger driven situation. They rarely make a permanent decision regarding any topic or event in anger. They have a comparatively higher risk of getting mad at every end of the situation. They forgive easily when asked for. These people can be very hard to be with as their nature and reaction are totally unpredictable. A person’s life does not only revolve around the home or workplace. When a person leaves home, along with him leaves the emotional problems that began within the four walls of his residence. Usually people refrain from taking along all the tension from office to home and vice versa. But factors like arguments between couples or family problems may increase the friction between the strings of anger. When a person leaves for the workplace along with these feelings there is undoubtedly a high chance of losing temper at any moment regardless of being short or high tempered person. The scenario is certainly similar to that of the vice versa condition. It is common knowledge that we are very comfortable in presenting our views and criticism to the person whom we know far well than any one else. We seem relatively way too open in expressing our opinions regardless of the extremity of the situation. Thus, there are comparatively more chances of a person making the situation complex on the basis of an offensive criticism. This may of course be like giving an open invitation to ‘Mr. Anger’ to bless everyone around. There are various reasons for anger to make it presence. After all it is one of the most perilous emotions. 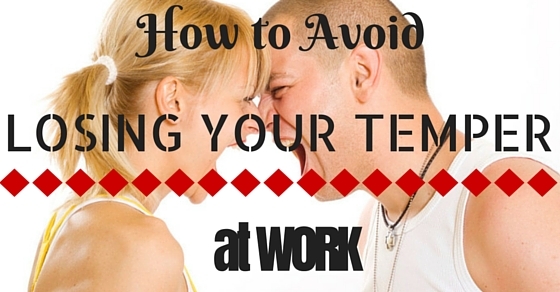 But how to not lose your temper or manage anger, especially at work? Outburst at work may not only tag you as ‘Mr. Hotheaded’, but also may ruin the career. So what are the ways to deal with anger at work. ‘Breathe in breathe out’, that is one of the simplest and effective way to calm down the situation and control temper. During discussions, teamwork, etc there are more chances of disagreements. Thus, at time like this, one must breathe in and breathe out in order to keep the temper at bay. Apart from just breathing, one can start counting after inhaling and exhaling, almost like yoga. When you are well aware of your short tempered attitude or may be the irritating day, then you should be prepared for conquering your temper the entire day. Anticipate yourself and turn your every move into a positive reply. When at a meeting or within a group discussion prepare yourself beforehand with possible answers. For example, you are to present a presentation, beforehand take a backup of the file to avoid any technical problems to hamper your hard work. After all, one could never depend upon technology entirely, it may betray you at times. 3. ‘Two negative makes an affirmative’ IGNORE! Yes, the English proverb is definitely not your answer when you are angry. If someone is angry at you and you as a result get angry back at that person; this scenario will only give you more trouble. It will not only damage your image but will also create an obstacle on your way to success. For example, if you and your colleague have a disagreement and he starts a fight, do not reciprocate to it. Keep your calm and walk away. The best solution to the situation will be to move away from the place where your temper is triggered. Best way to control or divert your mind from the emotion of anger is to fidget. When you have something in your hand to fidget with, you have less chance to focus on the trigger of your tension. Put a stone, pebble, pen, etc, in your pocket and keep fidgeting with while you are targeted by your trigger. It is indeed one of the most efficient ways to turn off the anger switch. Be it a meeting or a casual discussion this without anyone knowing, will control your rage from lashing out. The following mentioned are few best ways for overcoming anger or controlling anger. It is no myth that anger can greatly affect you and your career and so it is important to understand what triggers your anger fits. Thus, try and identify those triggers that keep targeting the ‘angry young man in you’. For example, Entrepreneurs are deeply attached to their work, they have faced all kind of challenges in building a position they stand now, thus when they face negative feedback on any of their work it surely raises their anger. Hence, here the trigger is to face a feedback, so instead of getting angry, you could work on improving it. Further, do not mail back to that very person as that may put you in a wrong position altogether. Once you have identified your triggers work on shoving them away from your way. Ignore your triggers for controlling your temper. For an instance, if you are stuck in traffic and are getting extremely late for your work then it will definitely be a trigger for your temper. Thus, to save yourself from experiencing such situation you could start on time. Prepare for everything the night before. This will definitely help you in controlling your anger and will prevent you from lashing out at anyone within the workplace. Laughing is the solution of many problems. It not only helps in controlling blood pressure but also enhances heart. But laughing is not limited to that; it also helps in ruling your anger. Further laughing will give you enough time to analyze the situation. It is difficult to focus on the emotion of anger when you are having a laughing session. Further, it might lighten the situation for the other person as well and one can put an end to the drama with a ‘sorry’ at the end. Working people spend a majority of their time in the workplace and so they have at least one person on the staff who is more comfortable, friendly and knows you well. At times when you lose your cool simply call for that person who you trust. Talk out and release your anger in private. That will save you from leaving a bad impression on people you don’t know. Use your anger as a driving force for yourself. This tip is for those who get angry at work. There is a possibility of your boss losing temper once in a while. That anger driven yell from your boss becomes a motivation for your temper to rise then divert it on some creative productivity. When you force all that anger on productivity, you not only come up with a good result but also make a place in your employer’s eyes. Think thoroughly before using your tongue in any situation. Words once spoken cannot be taken back; hence it is very important to keep a break over the tongue when you are driven by the anger. For example, if you have asked one of your co-workers and he hasn’t completed the work on time you shouldn’t plainly start shouting at them. The key word is ‘listening’, listen first before reacting as that will keep you from straightaway insulting someone in your anger. It might not only ruin your image in front of your co-worker but also affects his confidence in himself. Most of the people choose this method. But the only setback of this is you can not instantly start in front of everyone. This method is specifically to be practiced in private. Take a soft toy, pillow or even a cushioned chair, punch it or kick it and remove all your anger onto the inanimate object. This technique is best to use at home. For an instance, if a couple has a fight before leaving for work they can try punching the inanimate object in order to control their anger beforehand and leaving for work without any irritated feeling. This will ensure that you refrain from losing temper at work. People with anger issues are hardly able to accept the fact that they do get angry. In fact, the statement that they are angry also angers them. Thus, first accept the truth and then talk it out. Talking with a friend is easy but not everyone can understand what is wrong thus, a counselor is the best option to choose. You can also try to look at yourself in the mirror with the angry expression, at times nothing frightens female more than an ugly look. Every time you get angry to think of the ugly look on your face. Well, a workplace is a place where you work for your passion, to complete an aim, it is what one has always looked up to as one of the steps towards success. The path towards that final goal is going to be covered with all the possible obstacles; one of which is anger. Anger and rage may at times lead to violence, which is definitely not in the list of your ‘step to step’ success guide. So conquering the fury and walking on the step towards achievement each day should be a mantra. And if the temper actually troubles a lot then its time you switch to an anger management program.